At one time, the Victorians were much maligned for 'ruining' medieval churches with their restorations. That accusation seems to have gone out of fashion, as the realisation grows that most East Anglian churches were in a pretty dreadful state after the long years of 18th century neglect. There are still some wonderful interiors surviving from pre-Victorian days - Badley is probably Suffolk's best - but they would in any case have been the exception rather than the rule, and in general the Victorians saved the churches rather than ruining them. Anyone who still remains to be convinced that the Victorians were not complete villains would do well to come to Somerleyton. Here, that great 19th century millionaire eccentric, Sir Morton Peto, commissioned the London architect John Thomas to construct the extraordinary Somerleyton Hall. Then, in 1854, he paid him to rebuild the church. Bearing in mind that Peto was a strict Baptist, there was either something altruistic about this gesture, or entirely secular; the action of a man who wanted a view. Thomas found the building derelict,but rescued much of the tower, as well as parts of the chancel and north aisle; but the nave is all his, and the whole thing looks very well together. It isn't necessary to pay for a visit to Somerleyton Hall to see this church. You can reach it by a pretty drive across a bridge off the Somerleyton to Blundeston road. St Mary is just about the only church in these parts which isn't round-towered, and a lesser man than John Thomas might have demolished it to replace it with a competitor for nearby Herringfleet, Blundeston, Lound and Ashby. All four of these are particularly fine, but St Mary retains its square 15th century tower. The new work merges well, and Peto was keen to encourage (and pay for) the use of high quality materials. Ironically, at a time when so many Victorian buildings are requiring structural makeovers, it is the tower here which has recently needed of repair. Coming from the road, you approach the church in its wild graveyard from the south. The porch is in Thomas's restrained East Anglian style, and you pass through it into the nave. Turning back to face the south door, There is a stone panel bearing the evangelistic symbols above the doorway. It is a rare pre-Reformation reredos; Thomas's workers found it hidden under the floorboards in the 1850s. The glass is generally lovely, but the star of the show is one of Suffolk's finest rood screens. It is similar in style to that at Ranworth in Norfolk. The artist was not the same, but the person who painted this had certainly seen the one at Ranworth. From north to south, the saints are Michael, Edmund, Apollonia, Laurence, Faith, Thomas of Canterbury, Anne, Andrew, John, Mary Magdalene, Felix, Petronilla, Stephen, Dorothy, Edward the Confessor and George. If you stand back and take in the screen as a whole, you can see that there is an interesting dynamic at work. The saints are paired, so that they have a relationship across the nave: thus, the two outside saints, Michael (N) and George (S) are killing dragons. The next two in, Edmund (N) and Edward (S) are the two traditional patron saints of East Anglia. And so on. Some of the relationships are more obvious than others; for instance, Laurence (N) and Stephen (S) are both martyrs, and the two bishops are also paired. Apollonia is found on several East Anglian rood screens. She was that most essential of all saints in the medieval economy of grace; you asked her to intercede for you against toothache. She carries the instrument of her own martyrdom, as does her neighbour Laurence; these two are often found together on rood screens. Thomas of Canterbury has had his face rather more restored than the others, explained simply by the fact that he was the one of all these saints most viciously circumscribed by the Anglican reformers of the 1540s. His face was usually scratched out as a salutary warning. Dorothy is beautiful with her flowers, although I think Mary of Magdala the most gorgeous of all. St Andrew has a wisdom and serenity I've not seen anywhere else in Suffolk. A huge black and white monument dominates the north side of the chancel. It is to John and Anna Wentworth, who are represented by conventional busts, but is of interest because it was commisioned in the 1650s, during the puritan Commonwealth. The Wentworths must have been people of some influence, but the Latin inscription is carefully worded to ensure that this great edifice could be manufactured and erected under the eyes of the local Taliban. Not far from it is a later memorial to the splendidly named General de Bathe. He not only served in an official capacity at the coronation of Queen Victoria in 1838; he did so again at her funeral, 63 years later. 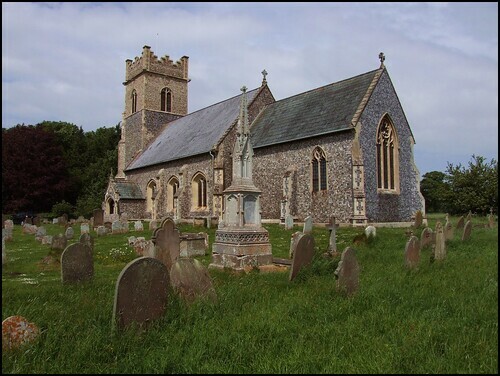 Although this church is some way from the village it serves, Somerleyton itself is worth exploring. Its Tudor cottages are pastoral and perfect. Too perfect, in fact; they were all built in the 19th century at Peto's direction. To build his vast palace, Peto had also demolished the 16th Century Somerleyton Hall, built by the Jernegan family, and later passing through the the hands of the Garneys and the Anguishs, two curious names, but common enough in this part of East Anglia. Peto provided his village with a railway station. This survives in use on the Lowestoft to Norwich line, and has a great sense of the wildness of Norfolk, the marshes of which spread bleakly away on the other side of the tracks. Unlike Norfolk, Suffolk got off very lightly at the time of the Beeching cuts, and there are still plenty of little railway stations out in the fields. You can visit many of them on the slow, stopping East Suffolk line, which takes an hour and a half to meander the forty miles from Ipswich to Lowestoft. Further north, over the Norfolk border, Berney Arms station is a mile and a half from the nearest road, and is thus the most remote railway station in England.